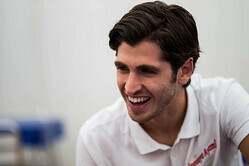 GP2 driver Antonio Giovinazzi has enjoyed test session in the Ferrari simulator at Maranello. The Italian, who is currently second in the GP2 championship, ten points behind Pierre Gasly, was invited to Maranello for the test session 48-hours after winning the feature race at Monza. "It was a very enjoyable experience and I would like to thank Ferrari for this opportunity," said the youngster, for whom it was his first experience in a Formula 1 simulator. "However, now it's straight back to concentrating fully on my GP2 programme for the rest of this season." Giovinazzi, from Martina Franca in the Puglia region, has four wins this season, compared to Gasly's three, with two rounds of the championship remaining.